One of the frustrations that teachers have had at the beginning of the school was transitioning from Microsoft Office to LibreOffice (or any open source office solution of their choice). The long short of it is this. Teachers have poured hundreds of hours into lesson plans, materials, presentations using Microsoft Office and when you open these resources in LibreOffice the formatting can be different. In some cases the formatting is only off by a little bit. In other cases it will take just as long to recreate the whole thing as opposed to fixing it. On the other hand spending $100 per teacher on Office every year is just not smart business and supporting open source projects (like LibreOffice) is good for competition and extremely responsible when it comes to the IT budget. Well I think I have a solution. 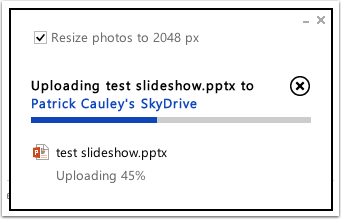 If you use Microsoft’s SkyDrive you can upload your PowerPoints, Word documents and more and it will show exactly as you typed it out (at least so far in my testing). If you’re too busy to do this, think of it as backing up your data to a secure place and having access to all those document in any classroom with Internet (in our case that’s nearly every room in our school). Read on past the break to see how to do this. Spoiler: It’s pretty darn easy. If you have your own solution or comment be sure to leave it below. We love comments at IT Babble. 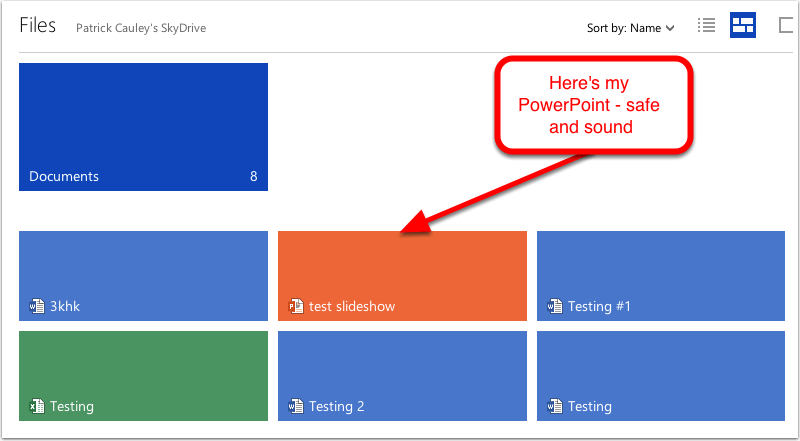 There are a lot or reasons to put your PowerPoints online and here are a few of them. You can’t lose or misplace them. On the other hand you can lose a USB. Your presentations are everywhere you are. Just log in and they are ready to go. You can still edit if you need to make a change. I’m sure there are more reasons but hopefully you think those above are well worth it. 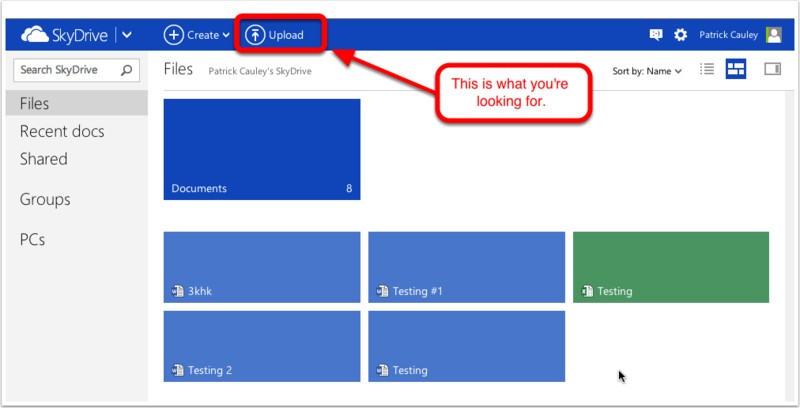 Microsoft SkyDrive is an online storage option, but it also will let you create or upload your Microsoft Office documents for you to edit or show. They give you about 7 GB of storage and I dare you to fill that up with Word documents and PowerPoints. They have recently changed it (as of August of 2012) and the design is actually a big improvement. So go ahead and sign in or sign up. After you log in it should look like this. If it doesn’t don’t worry the steps are pretty much the same. Look for the Upload option (it should be at the top if it’s not in the same place as mine) and go ahead and click that. While you’re uploading you will see this little box giving you updates on how long it has until it finishes uploading. For the record uploading just means loading your file onto a website. 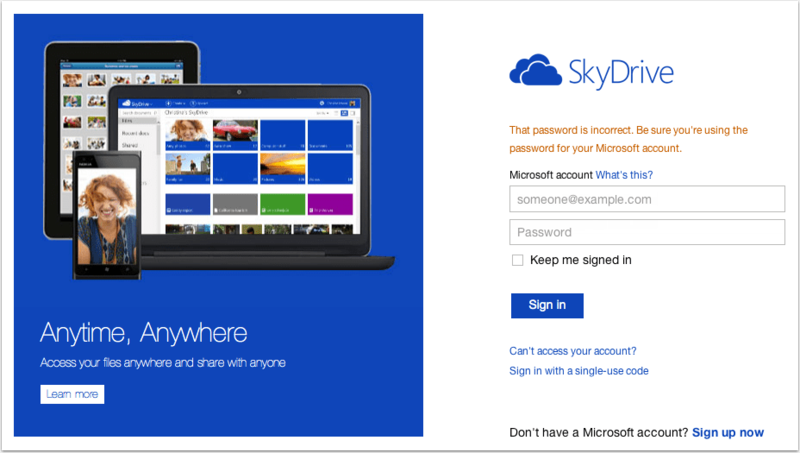 Now that it is on your SkyDrive account it is time to test it out. You will have a number of options at the top and I’ll break them down. File: Just your basic functions. You can share, print, edit download (yes you can save it on any computer or USB) and more. Edit Presentation: Just what it says. 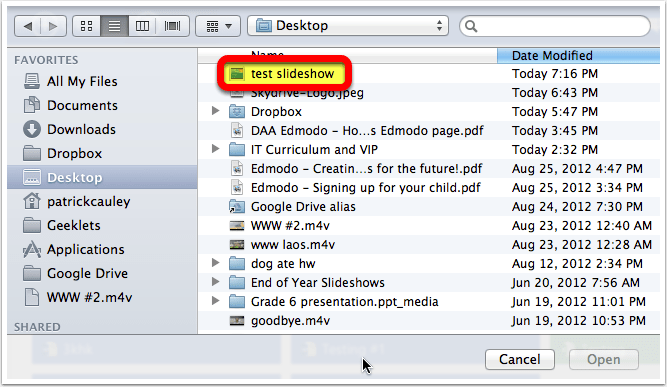 You can change info on slides, add slides, delete slides and more. Share: Put that USB back. You can share it with someone (or some people) who can edit, view, or just get a public link so anyone can view it. Start Slideshow: When you click this a new window will appear (full screen) playing the slide show. It takes a minute or two to open but it will and it will look great. Comments: If you want to add comments that you or others can see. 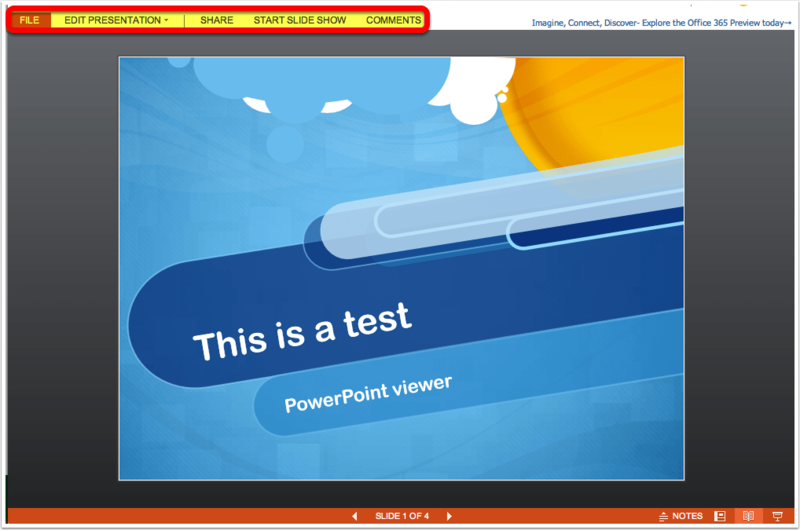 You’ve taken a PowerPoint, put it online for you to access anywhere and for you to share to your colleagues and students with a simple hyperlink. To check out my PowerPoint to see all that I’ve done click this link. I made this on My computer and uploaded it online. As you can see it works pretty well. This entry was posted in Patrick Cauley, tutorial and tagged formatting, libreoffice, PowerPoint, skydrive. Bookmark the permalink.